Reporting is the fundamental way you aggregate, filter, and analyze large collections of data in Workday. Reports help you ensure payroll and other vital HR processes are done correctly, on-time, and in compliance with policies. 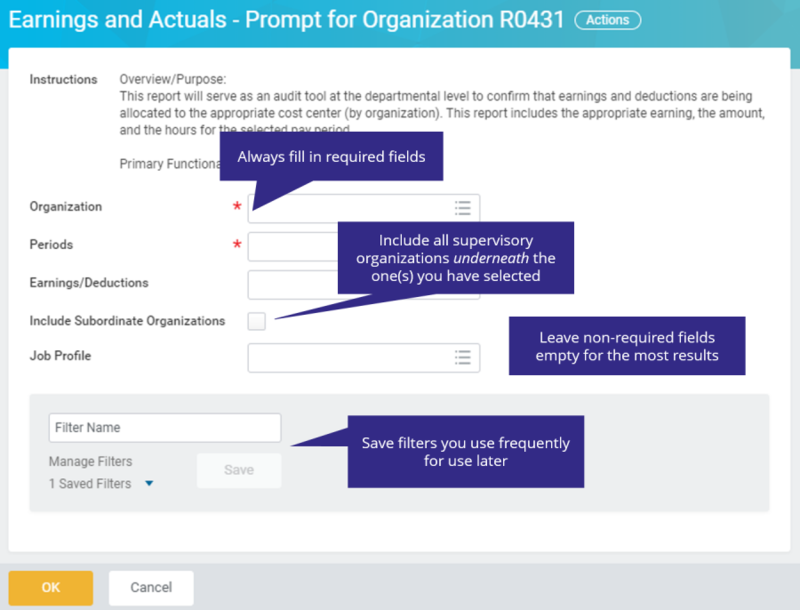 If you have the role of I-9 Coordinator for Organization A, but don’t have that role for Organization B, you will only be able to view reports and see data for I-9 Coordinators from the organization you have the role in, A. If you need to see the data from Organization B, you will need to request to have the security role for that organization as well. If you need the role, you can request it using the standard security role request process. Each report in Workday is either a “delivered” or a “custom” report. “Delivered” reports are designed by Workday the software company, and “custom” reports are built by the UW for UW. Custom reports have an R-number (e.g. 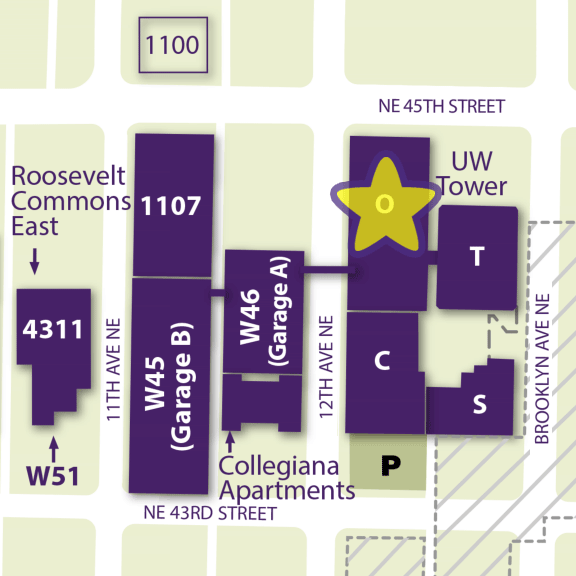 R0321) and are built for UW business needs and by user requests. Delivered reports do not have an R-number. Many delivered reports can be very useful to you, but custom reports are designed to accommodate UW’s unique business requirements. Find a report by typing its name into the search in Workday. Be careful to spell it correctly or use just partial search terms to find it. If you find an existing report in the Workday Reports Catalog that will work but you do not have access due to your Security Role, or cannot find one that meets your needs, please email the WMS Team for assistance. Do I have to run all reports via the search? Embedded reports: Refers to reports that are found embedded on certain screens in Workday. For example, Worker History, which is a tab available on the Worker Profile, is a report of every Workday transaction that has been initiated for an individual worker. You can export, filter, and sort embedded reports on the screens in which they appear. Dashboard reports: Dashboards are a Workday tool that aggregates several reports into a single screen in order to provide users with a high-level view of relevant to them. For example, the Manage My Work dashboard (PDF) is designed for HCM Initiate 2s, HR Partners, or Academic Partners a broad understanding of what is going on in their supervisory organization(s). Favorite reports: The Favorites worklet can help you add all the reports you commonly run to one worklet, so you don’t need to search for them each time. To learn how to set this up, use this Quick Guide (PDF). A prompt is the first screen that shows up when running a report. Prompts are one way to narrow the information a report returns to look for specific “cuts” of data. Knowing how to use them effectively can be the deciding factor in finding the data you need and either missing data you need or creating extra work for yourself. How do I use prompts? Read the instructions: A good first line of defense against confusion is to review any instructions displayed on the prompt screen. Required prompts: You will see a red asterisk next to the field name. This means this report requires you narrow information by that field in Workday. Leaving prompt fields blank: By leaving an unrequired field blank, you are including all of the data for that field in the report. Date prompts: Use date prompts whenever possible. Pulling data from a particular time period will narrow the number of results you need to analyze, and will also improve report performance. Knowing what data the prompt represents: In almost all cases, the name of a prompt matches/closely resembles the name of the corresponding field in Workday. Running the report and seeing the data it returns or looking into the choices in the prompt can help clarify this for you. To select/deselect all of the items in a multi-select prompt list, use Ctrl+A on a PC, or Command+A on a Mac to highlight all of the options. Once the blue bar on the left of them appears, use the spacebar to check/uncheck them. Step 1. Select the parameters you will reuse in the future. We don’t recommend adding dates, since you usually change these. Step 2. Give the filter a meaningful name you’ll understand in the future, and Select Save. The filter will now appear in the n Saved Filter dropdown area. You can delete a filter by selecting the x button when hovering over it, or view, edit and delete all of your filters en masse with the Manage Filters link. These filters are report-specific, so you will need to create the ones you use frequently for each of the reports you wish to use them on. *If the report is a “delivered” report, mentioned in the Finding a Report section you will not be able create these saved prompt parameters. Performance in reporting is heavily dependent on how much data is being requested from Workday. The narrower your prompts get, for example, the less data Workday will need to sift through and return. Some of the speed of a report is also dependent on how many columns of data it has to return, too. The best way to make a report run fast is to return a very narrow slice of data. We know that this isn’t always what you need, so, we have some tips! If you’re waiting for a report to run, one of the nice things about Workday is that you can have several tabs or windows open at a time. If you know you are going to be waiting for a report to run, try duplicating the tab you have open first, run the report in the duplicated tab, and working on something else in the first tab. If you don’t have something else you can work on while it runs, you can also click the “Notify me later” button. What this will do is send a copy of that report to your Workday inbox. Keep in mind though, that this will always send the report in excel format, so if you wish to manipulate the data inside of Workday you will need to wait and not click that button. If something is taking too long and you realize that you can narrow your prompts a bit more, simply click the cancel button to get taken back to the prompts screen. Once you’ve run a report, there is a lot more you can do to manipulate the data returned. If you have not exported it and are looking at in Workday, each column can be sorted and filtered in the terms you wish. To do this, just select the header of the column, and use the menu to manipulate the information displayed in the rows of data returned. If you have a very detailed report, some of them allow you to hide columns that you don’t need. Use the columns icon at the top right of the table to select which columns of information are relevant to you. If you do not see this option, it may not be available on the report you are running. When interpreting the data, it’s important to take note of the name of the column header. This is almost always (unless it was designed as a custom element for the report) the exact name of the field in Workday screens where it is entered or filled in. For example, reporting fields like job profile, time type, and worker subtype are all pieces of information that can be found on an employee profile. Last, you have the option to export the report as either an excel sheet or a pdf. We recommend using these buttons at the top of the report, and not at the top of the table. This will export any prompts you used as well as the title of the report. If you intend to export the report, any of the manipulation you did with filtering or columns will be lost. So as a rule, if you plan on exporting and manipulating the data in Excel, start by downloading the report. Always keep data security in mind! All of the reports in this area are pay-impacting and are used as frequent auditing tools by differing HR roles on campus to ensure successful data collection and on-time payment. Need help with Workday Reports? Submit a request to the ISC via the Workday Reports Help form.